Neck and shoulder nerve blocks. Outline artwork of a female figure showing a frontal (anterior) view of the lungs (pink), rib-cage, trachea, vertebrae, and the nerves of the brachial plexus (yellow, upper right) and the left arm. The front ribs and the sternum (breast bone) have been removed. The brachial plexus is a group of nerves branching from the cervical and thoracic spine, over the first rib, under the clavicle (collar bone), and into the arm. 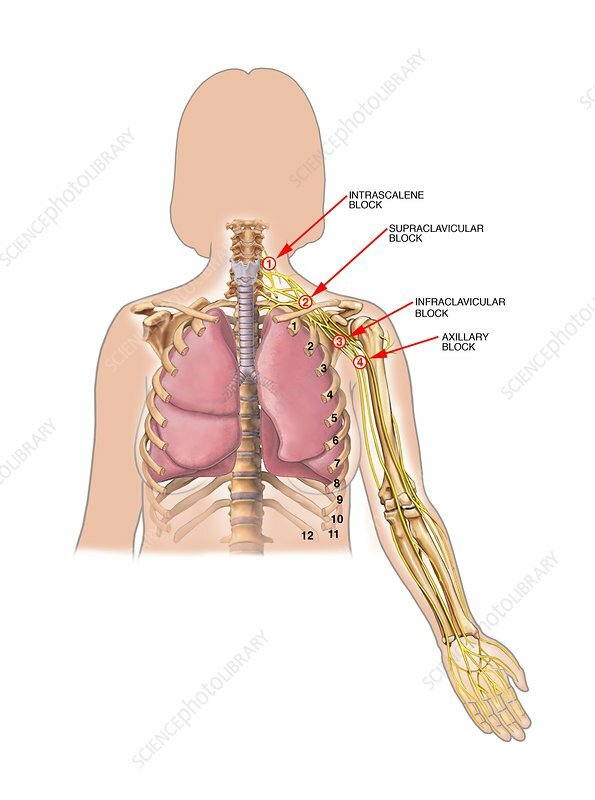 Nerve blocks applied at different levels for shoulder and arm surgery are: intrascalene (scalene muscles), supraclavicular (above the clavicle), infraclavicular (below the clavicle), and axillary (armpit).